Sunnyview Elementary School is off to the zoo! Meanie Meredith is head over heels for the pink flamingos (even though they are the most evil color ever), and Eugene can’t wait to see the elephants. Unfortunately, they seem to be missing. 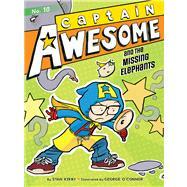 Once again, it’s up to Captain Awesome and his superhero pals to fight evil (MI-TEE!) and see past the diversionary tactics of their tour guide in order to find and rescue the most awesome animal in the park. With easy-to-read language and illustrations on almost every page, the Captain Awesome chapter books are perfect for beginning readers.